This article is the last in a series that originally appeared in AN’s July/August 2018 issue which focuses exclusively on Texas and was guest edited by AGENCY. The essays examine architecture and practice across the southern border of the United States. Prada Marfa is a building born out of the political tensions arising in post-9/11 America, in which Afghanistan, Iraq, and Mexico become scapegoats. In 2003, a United States-led coalition invaded Iraq, beginning an eight-year war, and in 2005, Duncan Hunter, who at the time was chairman of the House Armed Services Committee, called for the construction of a wall along the entire border between the U.S. and Mexico. This led to his amendment to the Border Protection, Antiterrorism, and Illegal Immigration Control Act of 2005, which called for 698 miles of wall along the U.S.-Mexico border. This paved the way for the Secure Fence Act of 2006, which President George W. Bush signed to “help protect the American people” from several purported threats, but primarily terrorism, which was the major focus of the era’s political rhetoric. Prada Marfa is constructed out of traditional adobe bricks which have long been used in the region but are frequently perceived as an inferior material despite their ecological and climatological responsiveness. 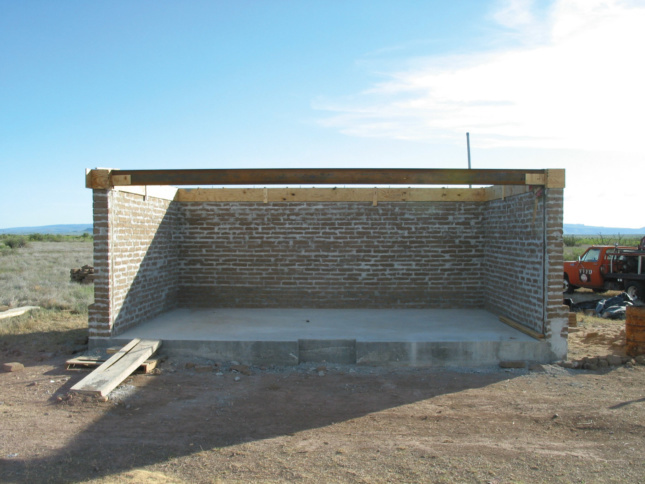 Adobe bricks provide the foundation for the oldest extant buildings in the region, as well as many of the area’s most important cultural and heritage sites, including artist Donald Judd’s own Block compound in Marfa. Directly referencing Judd and the military building traditions he emulated, the adobe bricks are intentionally set in a cement-based mortar. Judd recognized that this was the technique employed in the construction of barracks, hangars, and forts in the region, and Prada Marfa is constructed to reflect this mistrust of local traditions of the militaristic architecture that secures the border displays. Adobe brick was validated as a construction material, but not adobe mortar, which is more likely to be used on the humble houses of Mexicans and Mexican Americans on both sides of the contemporary border. While the adobe walls of Prada Marfa are indigenous, they are not perceived to be native to the United States, as the tradition is a spoil of the Mexican-American war. The form of the building recalls a West Texas vernacular, which is influenced by the melding of many cultures at the border. The artists Elmgreen and Dragset are from Denmark and Norway, respectively. The details of the interior come from Italy. The specifications for the shelves, the typography (a variation of a type popular with American engravers and typefounders in the last third of the 19th century), the color of paint for the interior walls, the lighting, and the carpet were directly sampled from Prada’s own architectural details for retail outlets in Milan. The inspiration for the facade is sampled from German photographer Andreas Gursky’s photograph Prada II. The building is sprayed with an elastomeric white latex coating to reflect the powerful rays of the sun and withstand the extreme expansion and contraction of the building’s structure in the fluctuating desert temperatures. Prada Marfa was a very new kind of work. 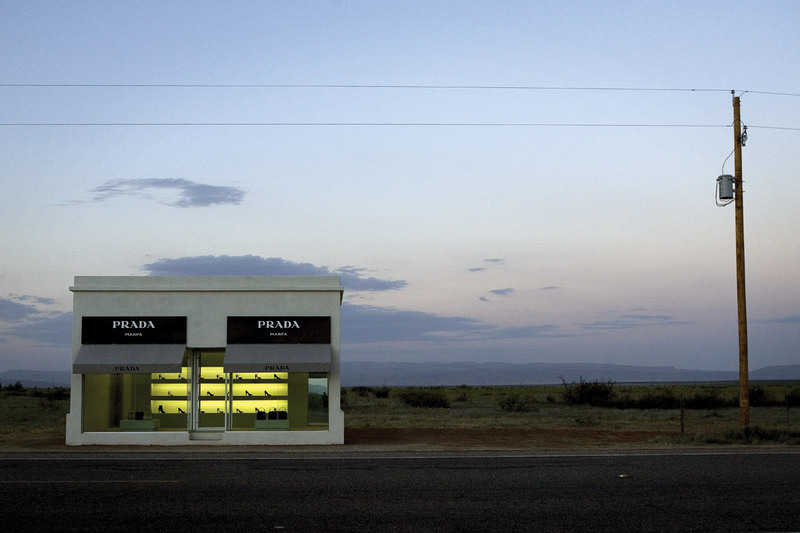 Unlike the reserved and apolitical work of Judd—who in Marfa had already laid claim to art and what it should be—Prada Marfa blurs the boundaries between architecture, art, politics, and culture. 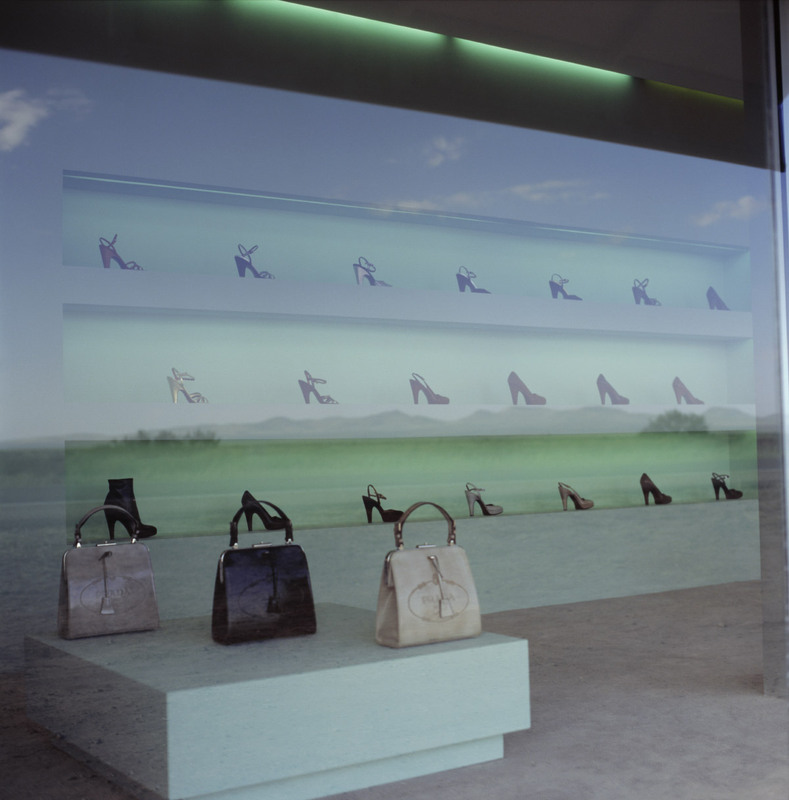 The very same night that Prada Marfa opened, xenophobes attacked the work, stealing the shoes and purses, destroying the building’s facade, and spray painting “dum” [sic] and “dumb” on the inside and outside of the building. Prada Marfa represented a very new kind of artistic expression that was unfamiliar in the region and challenged conservative artistic sensibilities, calling into question the juxtapositions between wealth and poverty, the U.S. and Mexico, anglo and Mejicano, of the region that the building highlighted. Many other forms of vandalism have taken place. Men’s underwear was shoved into the drain pipes, causing the roof to flood and inundate the interior, which required the shelving to be rebuilt and repainted and the carpet to be replaced. Most dramatically, an artist by the name of Joe Magnano was found guilty of two counts of misdemeanor criminal mischief and required to pay Ballroom Marfa, the caretaker of Prada Marfa, $10,700 and a $1,000 fine for attempting to paint the building blue and pasting TOMS, the logo of a shoe brand founded by Texan Blake Mycoskie, on it, perhaps in an inadvertent attempt to make a structure perceived to be “not from around these parts” more Texan. The vandals who destroyed the building after it first opened, however, have never come forward, although it has been suggested that the borderland surveillance systems used to monitor immigrants traveling in the desert may be able to reveal these criminals. Prada Marfa has become a pilgrimage site where those making the journey to visit the building have left mementos as part of what has become a kind of hajj to this art Mecca. The various offerings at the Prada Marfa site have included visitors leaving one used shoe, placed around the building or atop the fencing surrounding the building. Perhaps this references the single shoe found in the faux shoe shelves of the store, or maybe the worn-out shoes of immigrants who journey by foot to the U.S. from Mexico until the soles of their shoes wear away, before being picked up in the landscape surrounding Prada Marfa. Not unlike the Jewish mitzvah where visitors to a grave leave small pebbles on a gravestone, visitors have also left small rocks, holding down a piece of paper with a name, message, or a business card, on the narrow ledge that surrounds Prada Marfa. This act reminds us of the harsh reality of a landscape where countless die in the desert, just as the wall has pushed people to greater extremes on their journey north. The shoes and the pebbles left by art pilgrims were systematically removed as they were also perceived as a form of vandalism—a crime, rather than a new tradition—and a fence was constructed around the building made of welded wire mesh, reminiscent of the transformation of the U.S.–Mexico border from a barbed wire fence to stretches of welded steel. The construction of the fence surrounding Prada Marfa, however, has prompted another tradition of offering at the site. 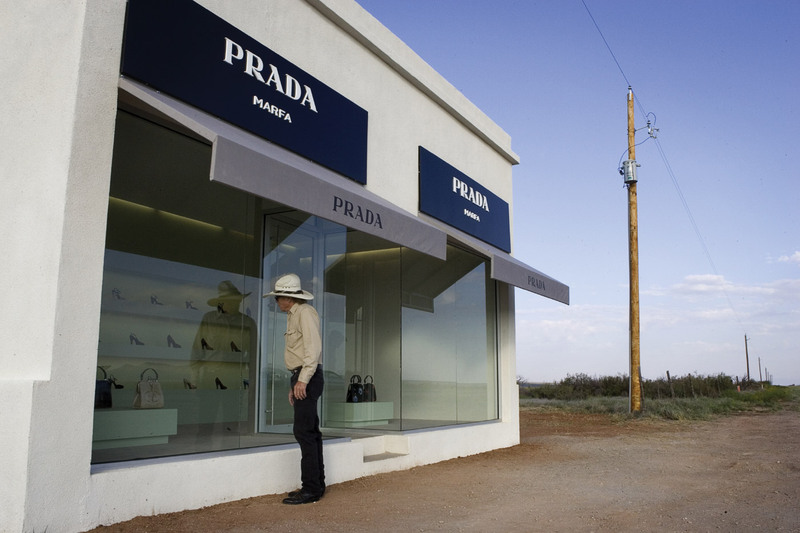 While called Prada Marfa, the building is technically just outside the small town of Valentine, Texas. Despite a population of 217, the town is inundated with over 1,000 people on Valentine’s Day, as well as hundreds of Valentine’s Day cards that are sent through the local post office, which has been known as a “love station.” Today, “love locks,” padlocks used by sweethearts to symbolize their love, are attached to the new fence surrounding Prada Marfa, and the keys are thrown away. Perhaps this, too, symbolizes the time we live in, mired in a national struggle between the fences that divide and the love that could bring us together in the borderlands. Ronald Rael holds the Eva Li Memorial Chair in Architecture at the University of California, Berkeley, and his architectural practice, Rael San Fratello, was the designer of Prada Marfa. He is the author of Borderwall as Architecture: A Manifesto for the U.S.-Mexico Boundary.